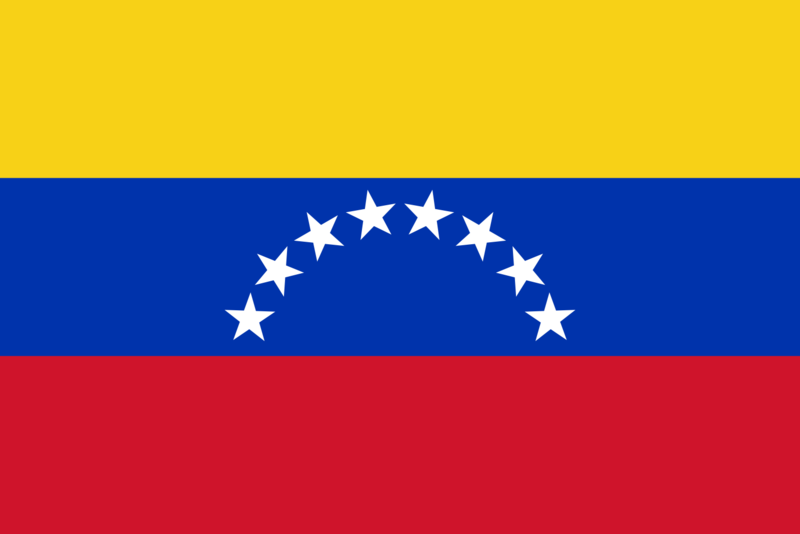 The current flag of Venezuela was introduced in 2006. The basic design includes a horizontal tricolor of yellow, blue, and red, dating to the original flag introduced in 1811, in the Venezuelan War of Independence. Further modifications have involved including a set of stars, multiple changes to the placement and number of stars and inclusion of an optional coat of arms at the upper-left corner. Yellow: Represents the riches of the country, the wealth of Venezuelan soil, gold, sovereignty, harmony, justice and agriculture, as well as the Sun, the source of Light. Red: represents independence from Spain. The flag is essentially the one designed by Francisco de Miranda for his unsuccessful 1806 expedition to liberate Venezuela and later adopted by the National Congress of 1811. It consisted of three equal horizontal stripes of yellow, blue and red. Miranda’s flag is also the inspiration for the flags of Colombia and Ecuador. This original design was first flown on March 12, 1806 at Jacmel, Haiti as Miranda’s expedition prepared to make the final leg of its voyage to Venezuela. The flag was first flown over Venezuelan soil at La Vela de Coro, on August 3. Until August 3, 2006, Flag Day was celebrated in Venezuela on March 12. Since 2006 it has been celebrated on August 3.